Trash pick up days are Friday, unless a holiday is that week, for which the pick up day will be Saturday. See the calendar for dates. CLICK HERE for updated calendar for 2019. 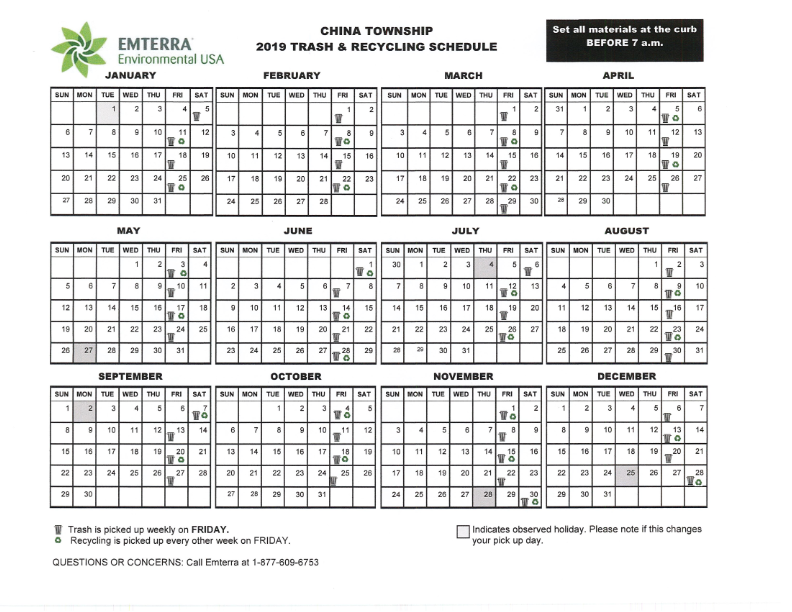 Emterra Environmental USA is serving our China Township residents. Recycling bins are available at the Township Hall. Every Resident is allowed ONLY 2 bins. If you have any complaints or concerns regarding your trash or recycling pick up please contact Mary Kay Harris at Township hall (810)765-1145 ext 206. Please call her and give her your name, address and phone number. Her hours are 12-5 Monday through Thursday, so you may leave a message. When a holiday falls on a week day, trash pickup will be on Saturday. Saturday pickup will be for these holidays: New Years, Memorial Day, Independence Day, Labor Day, Thanksgiving Day, and Christmas Day. CLICK HERE FOR GARBAGE/RECYCLING Collection information.